Mechanically-activated, narrow-angle float switch designed to activate pump control panels and alarms. Mounting Clamp: for applications where the switch can be attached to a discharge pipe or similar mounting device. Externally Weighted: for applications where the switch can be suspended from above. FEATURES n Mechanically-activated, snap action contacts. 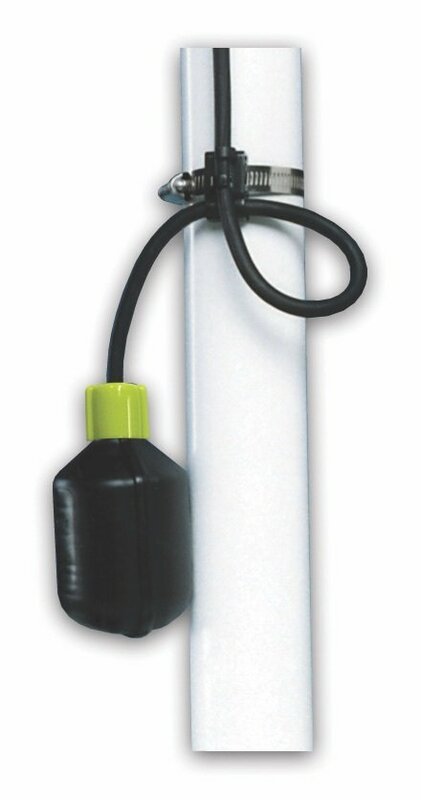 n High impact, corrosion resistant, polypropylene float housing. n Not sensitive to rotation. n Control differential of 1.5 inches (4 cm) above or below horizontal. n Yellow colored cap for easy identification of normally open control switch. n White colored cap for easy identification of normally closed control switch. n UL Listed for use in water and sewage. n CSA Certified. n Five-year limited warranty. This narrow-angle sensing device is used to accurately monitor liquid levels in: n water n sewage applications The SJE SignalMaster® control switch is not sensitive to rotation. Normally Open Model (high level) The control switch turns on (closes) when the switch tips slightly above horizontal signaling a high level, and turns off (opens) when the switch drops slightly below horizontal. Normally Closed Model (low level) The control switch turns on (closes) when the switch tips slightly below horizontal signaling a low level, and turns off (opens) when the switch tips slightly above horizontal.